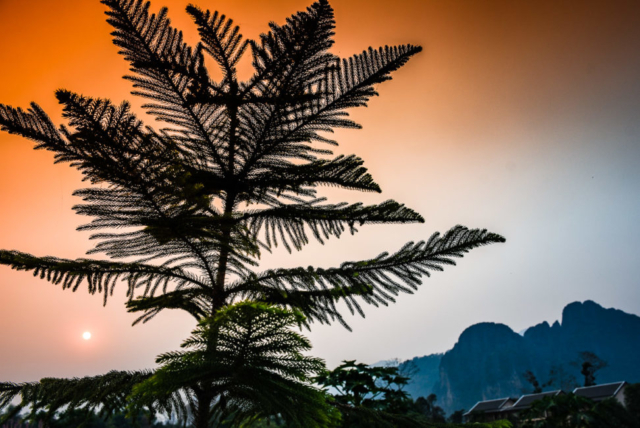 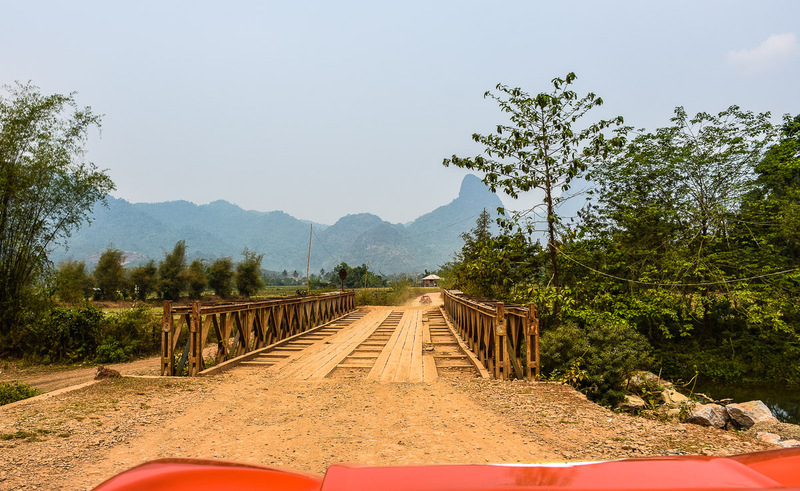 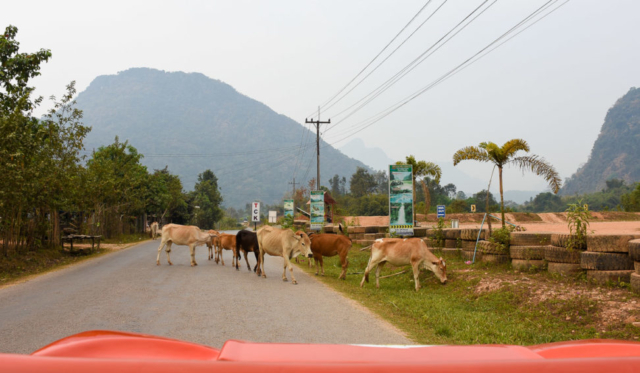 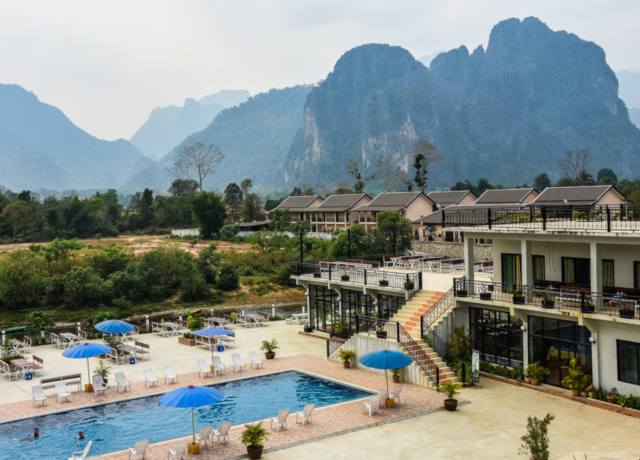 A free hotel shuttle took us into Vang Vieng the next morning and I knew I’d miss the Sanctuary as soon as we hit tourist central an hour later. 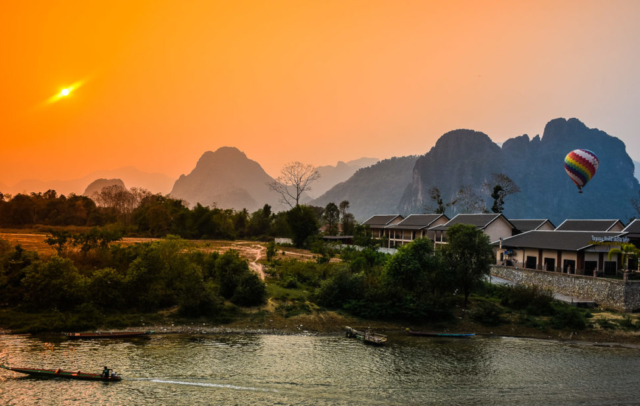 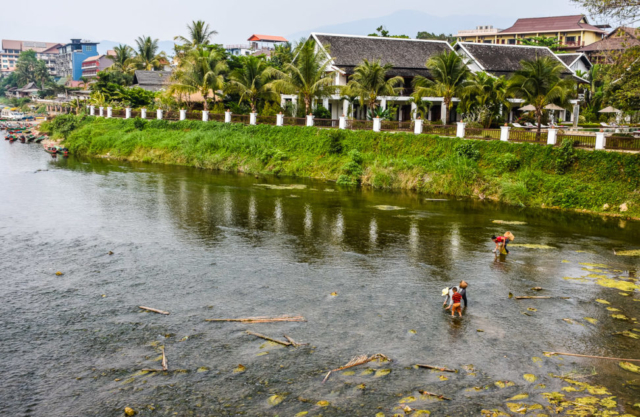 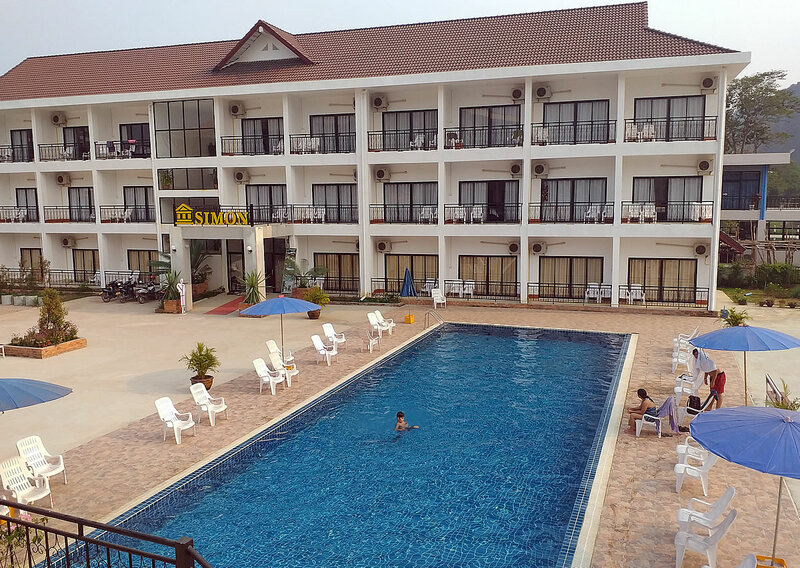 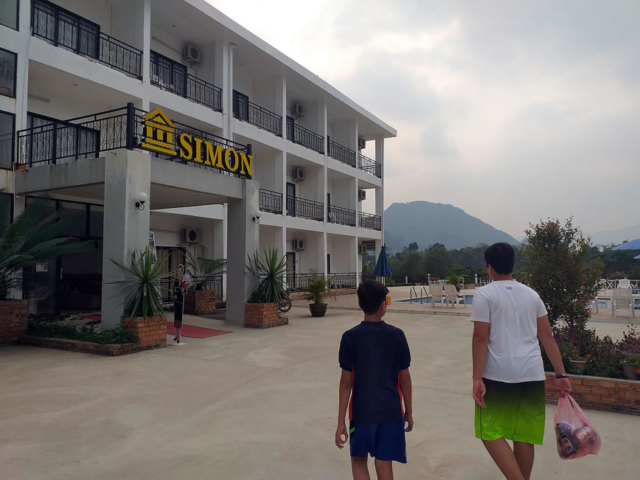 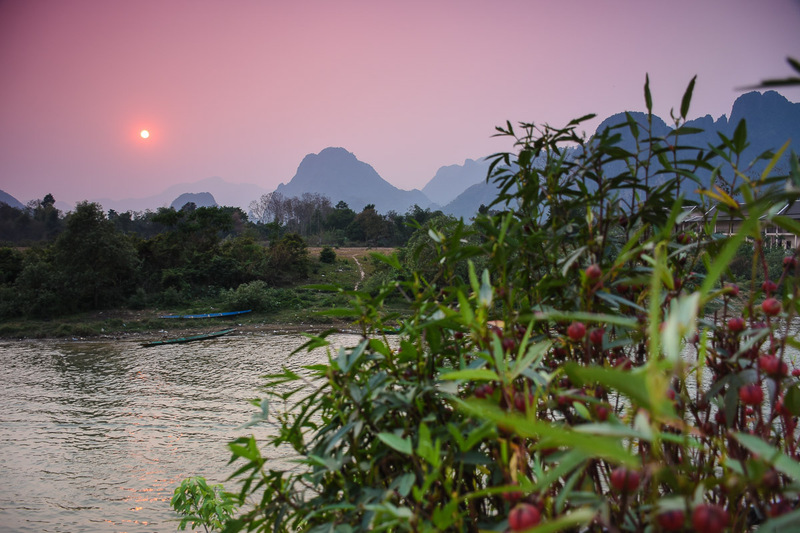 Our accommodation in Vang Vieng was a riverside resort called Simon. 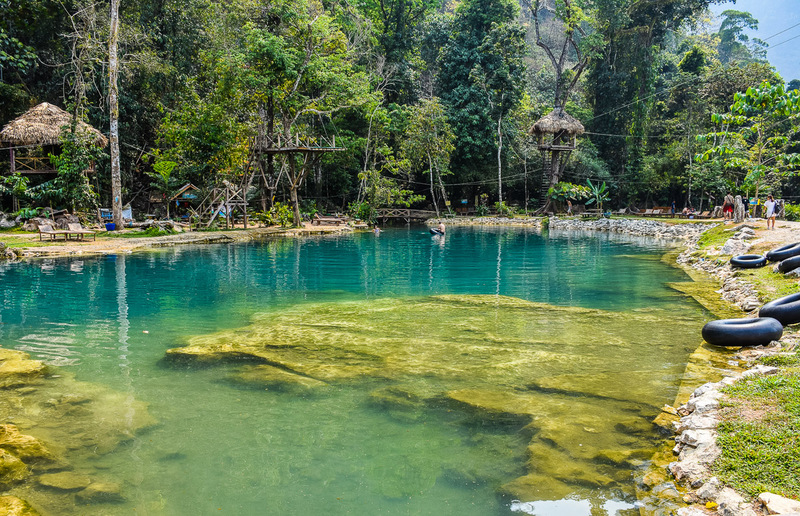 Again the permanent miasma partially obscured what would have otherwise been an epic view but the pool was extremely inviting. 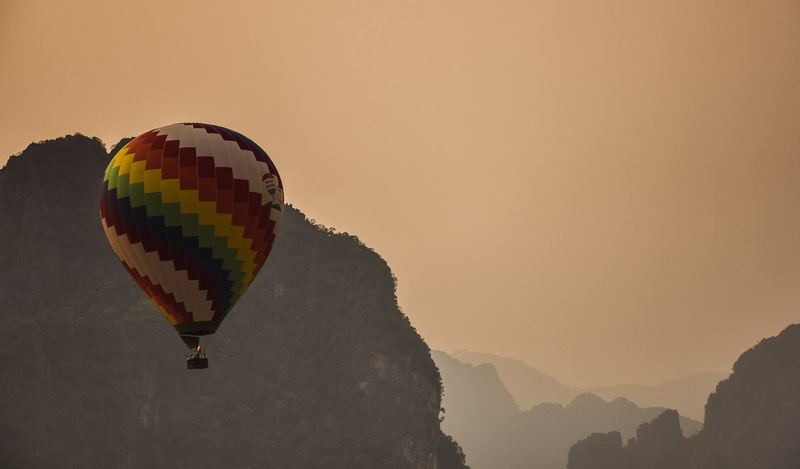 As the sun dipped the view improved, especially when we first glimpsed the hot air balloon as it drifted over on the balmy evening breeze. We wandered into what seemed like a quiet village for lunch. The reason for this became apparent in the evening when the place came alive with hordes of Chinese tourists milling around like flocks of sheep, millennials belting about in dune buggies with Bluetooth speakers blaring the latest pop tunes, and bearded strung-out looking backpackers wandering about carrying big Beer Lao bottles with young girlfriends in tow wearing very little. 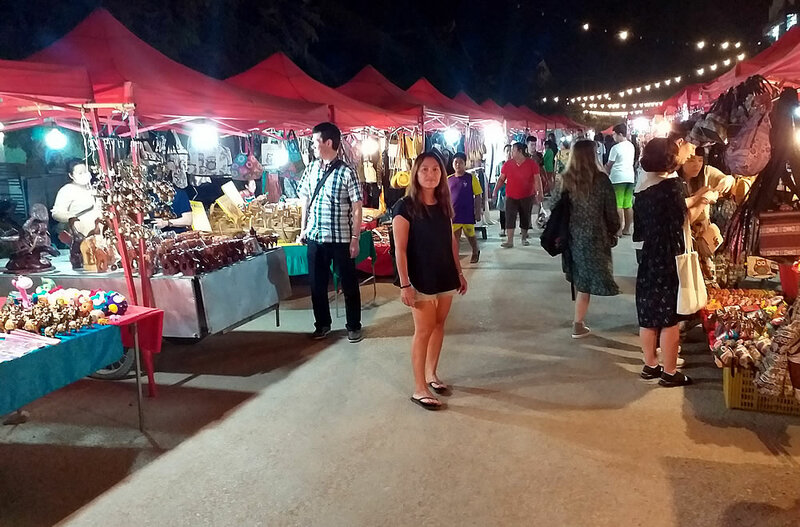 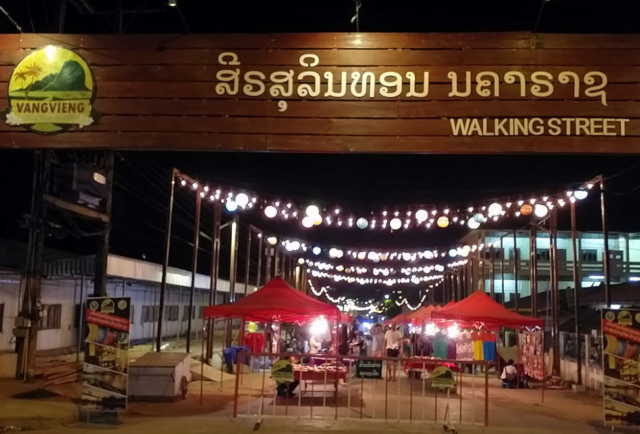 A token walking street and night market offered t-shirts, shoes, sunnies and bags for a couple of bucks and rows of restaurants and bars that all appeared very similar lined the streets. The kids wanted to go tubing the next day and I secretly fancied the idea myself. 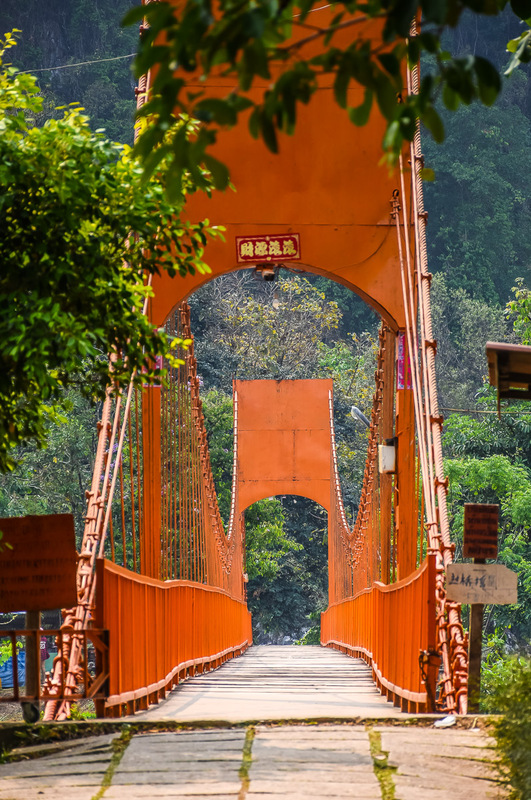 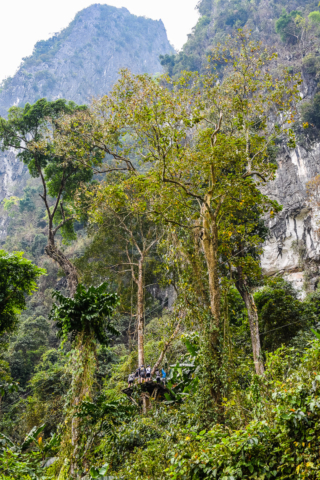 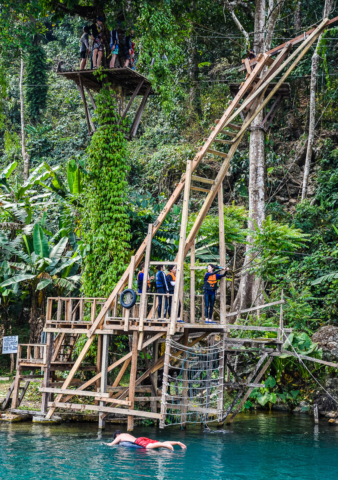 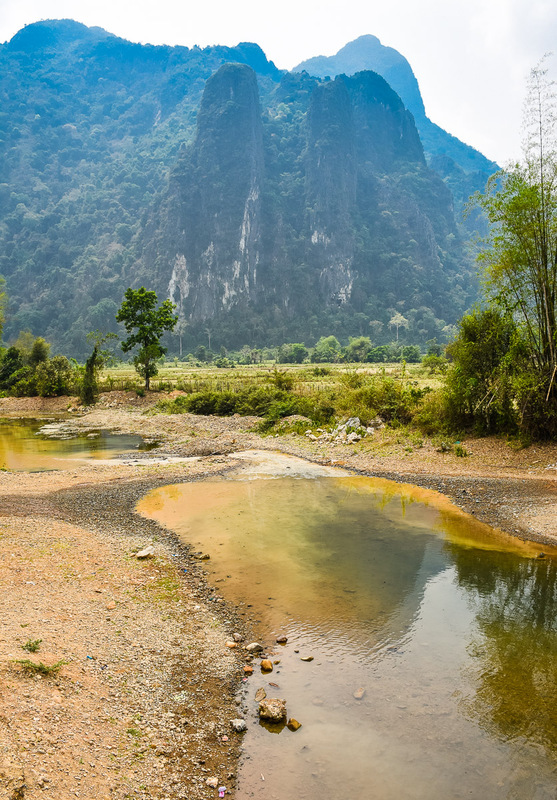 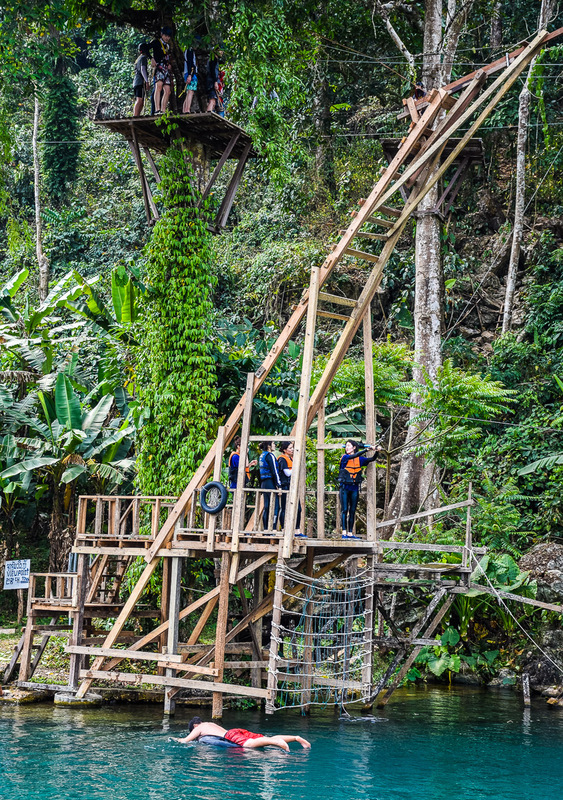 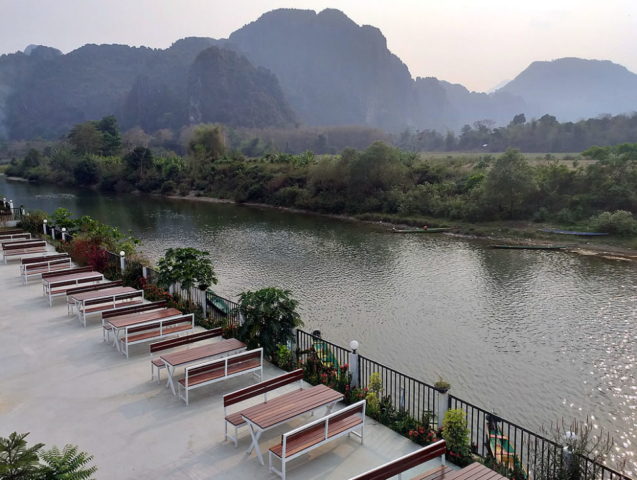 For a very modest 50,000 kip (180 baht) per person the trip would take all afternoon to cover 5km or so of the picturesque Nam Song river valley north of the town. 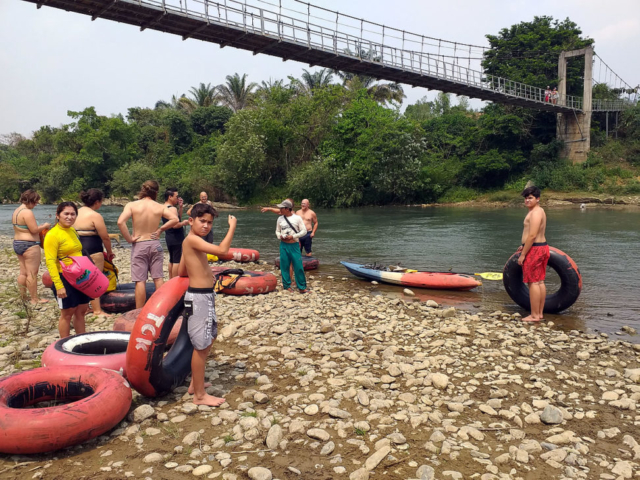 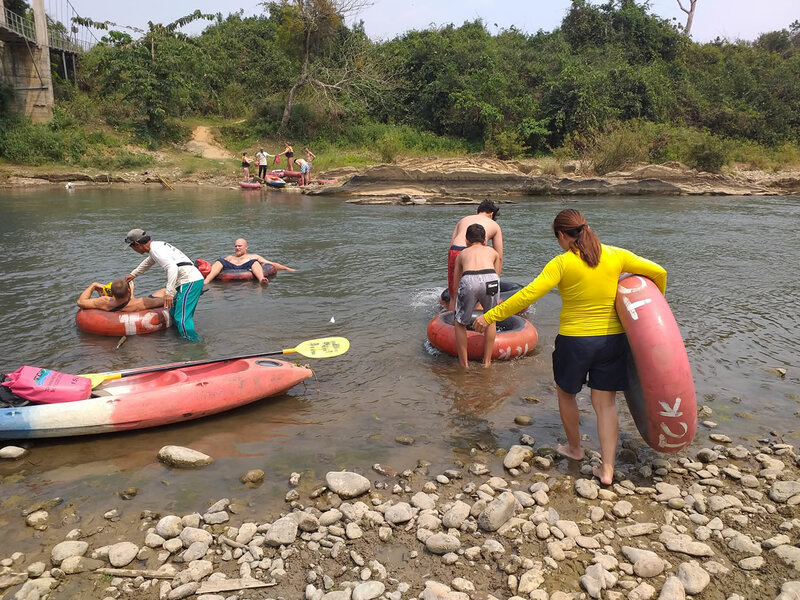 Floating down river was rather relaxing and the first stop was a bar where you got a free beer as part of the trip – there is no way this would happen in the Thailand of today, it would probably be banned for some supercilious reason or other. After an hour of chilling out and competing with the young-uns on the rope swing we flopped back into the tubes with a light beer buzz to resume the lazy float downstream. 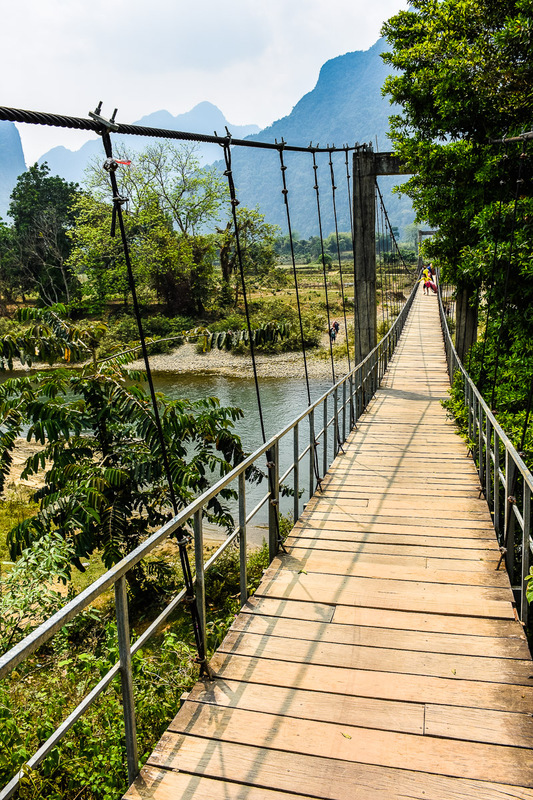 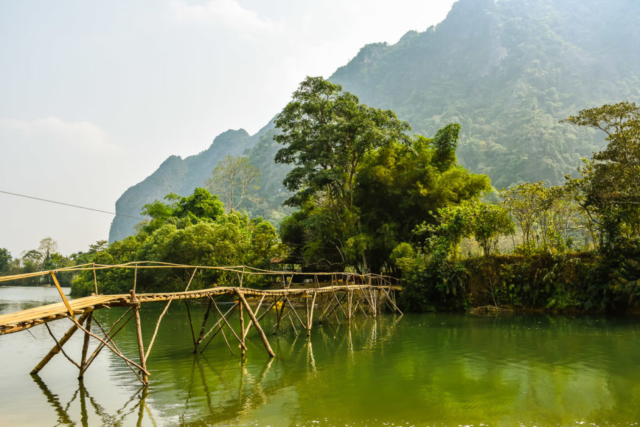 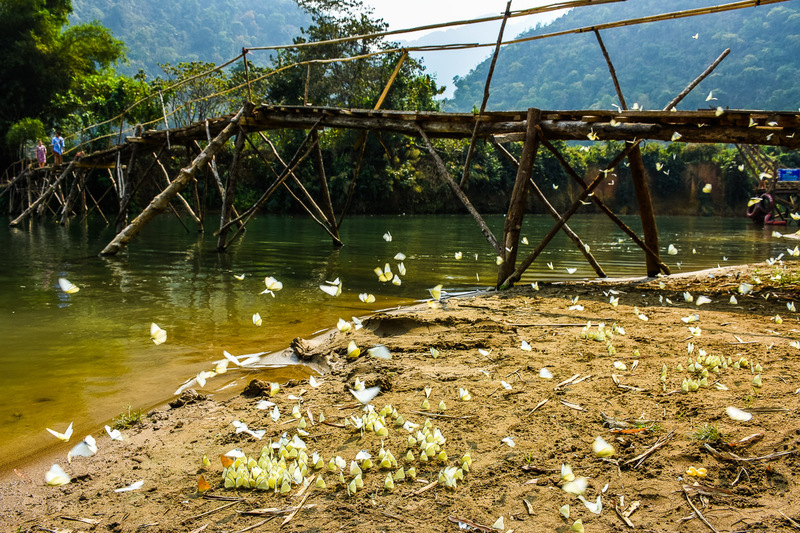 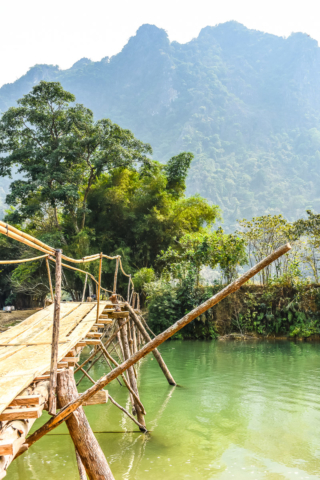 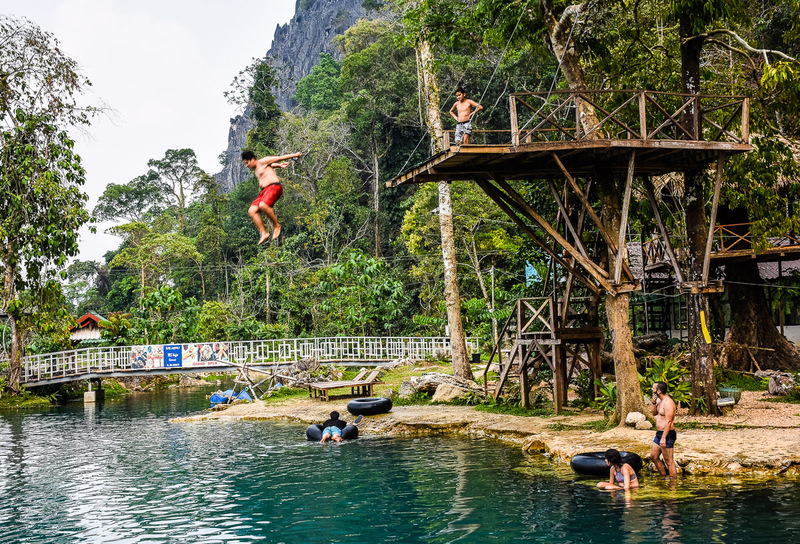 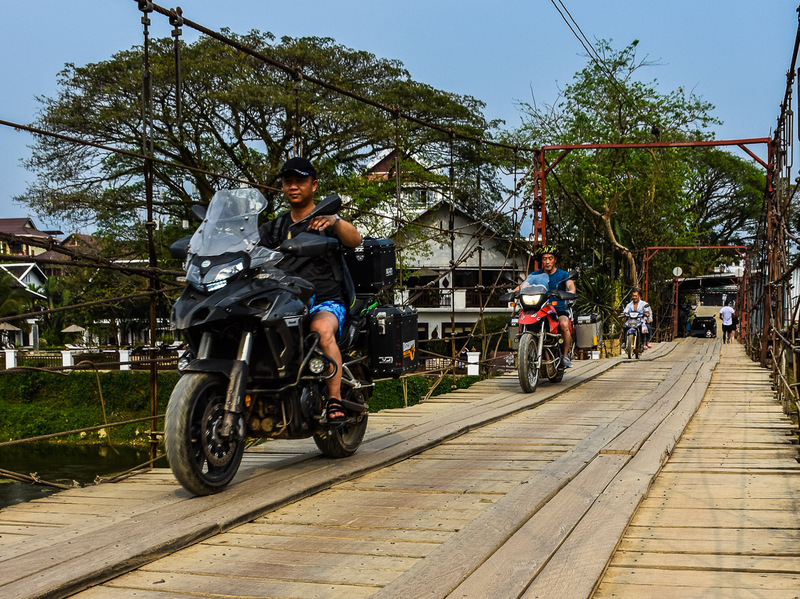 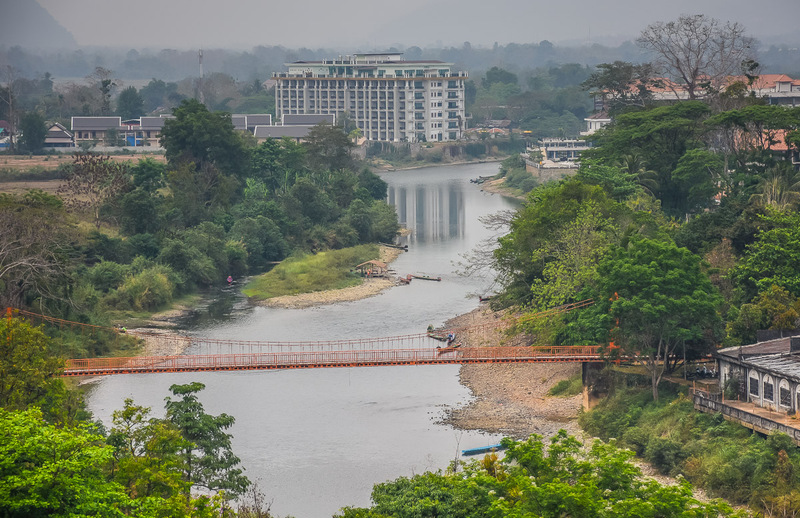 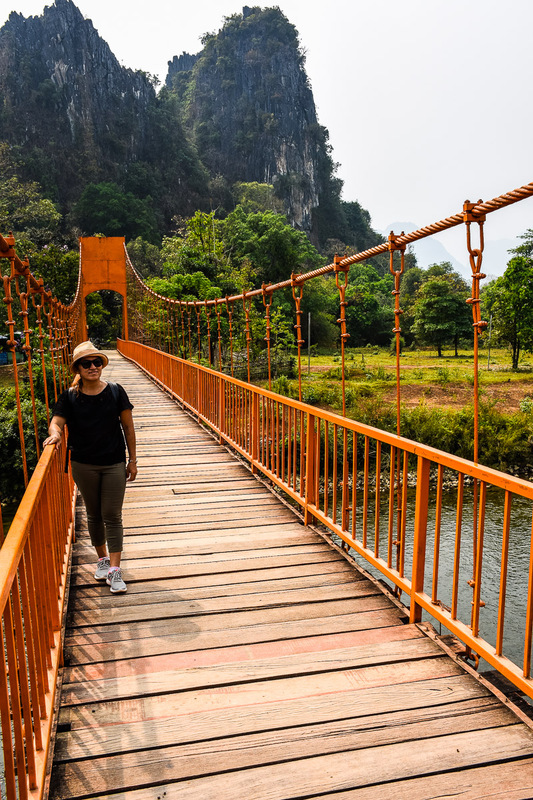 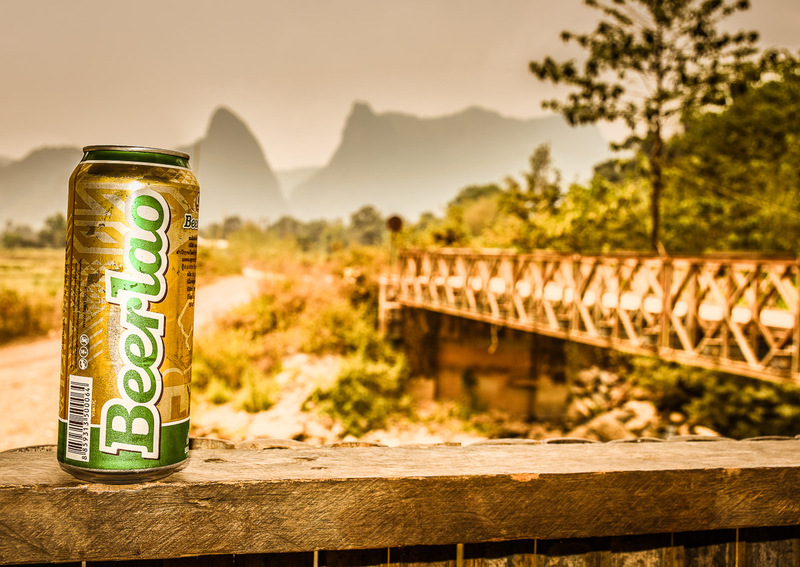 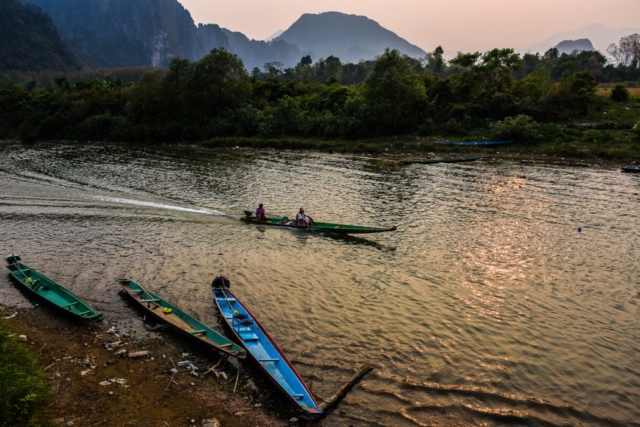 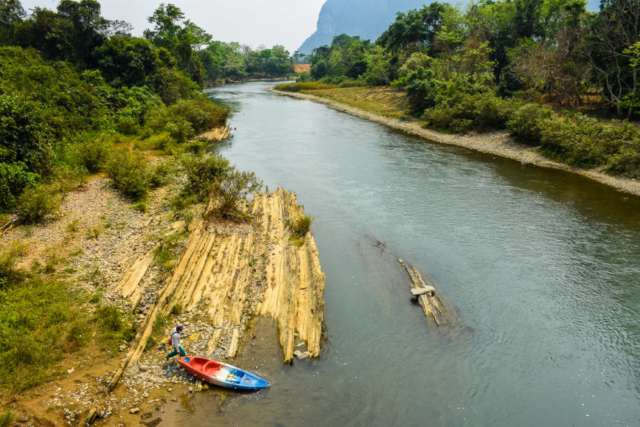 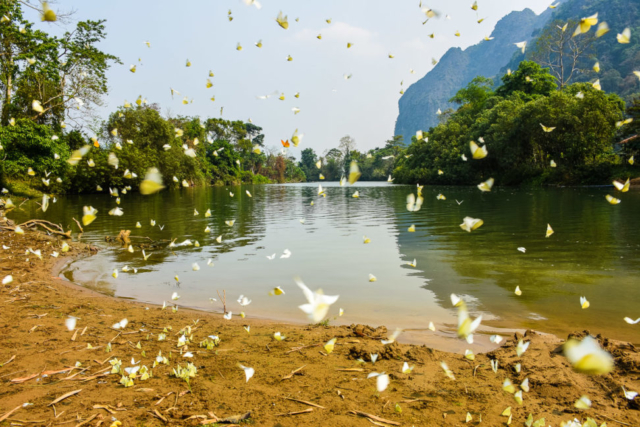 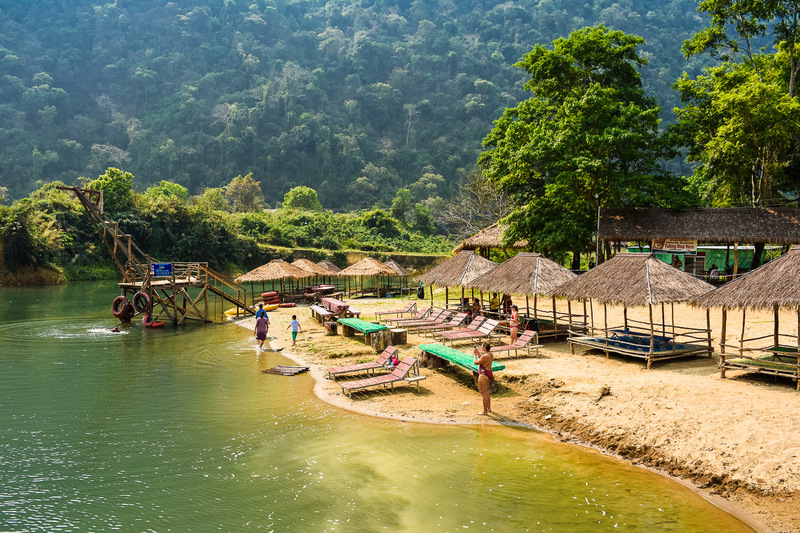 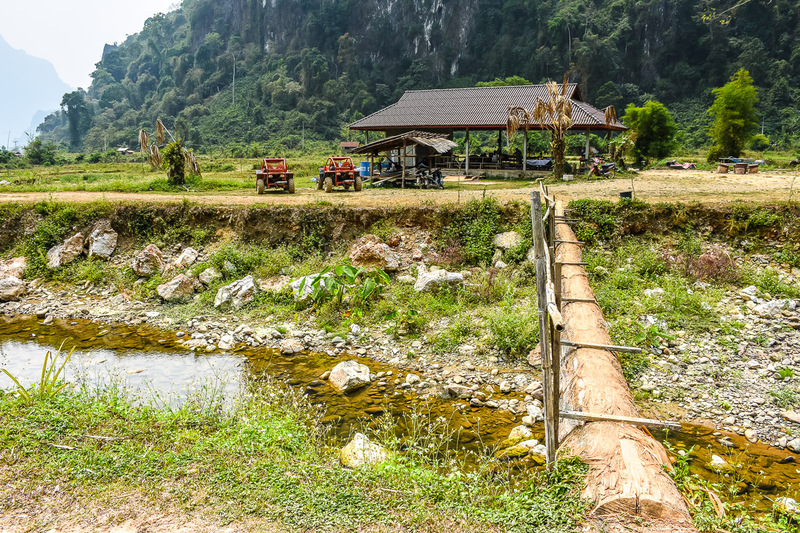 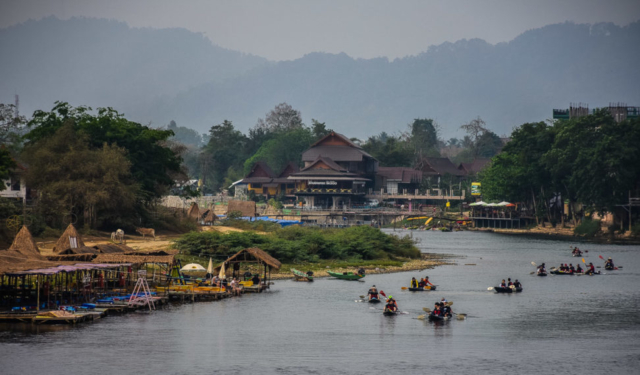 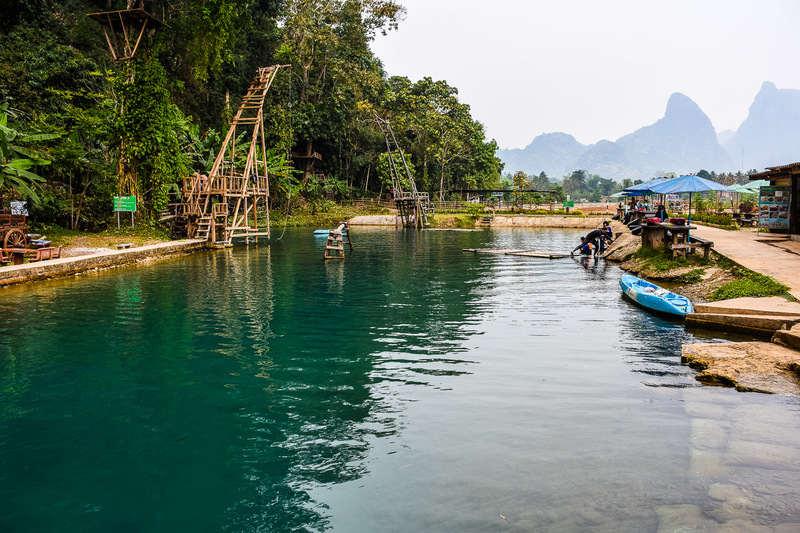 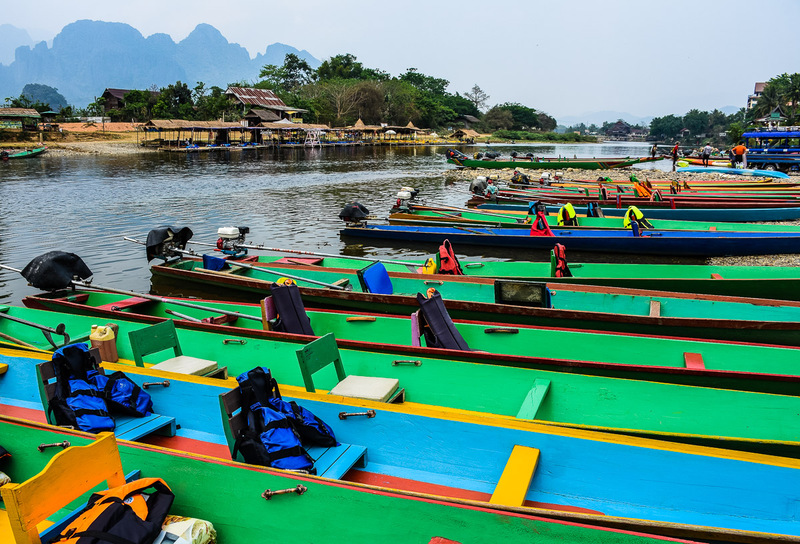 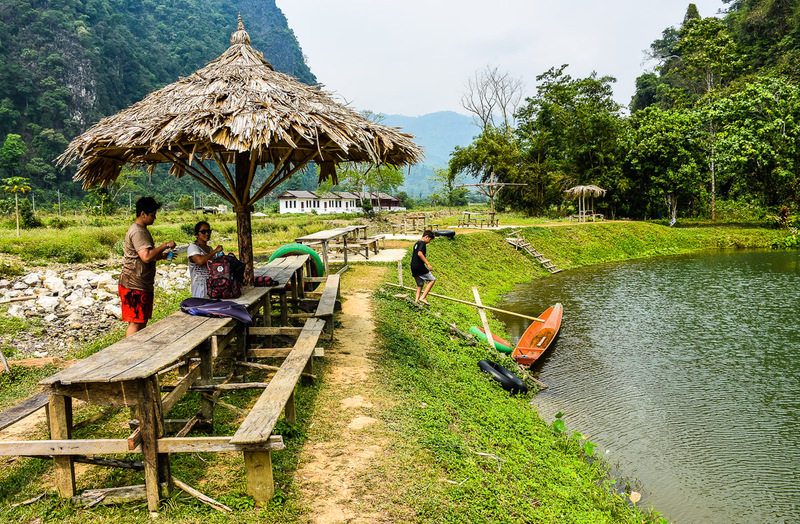 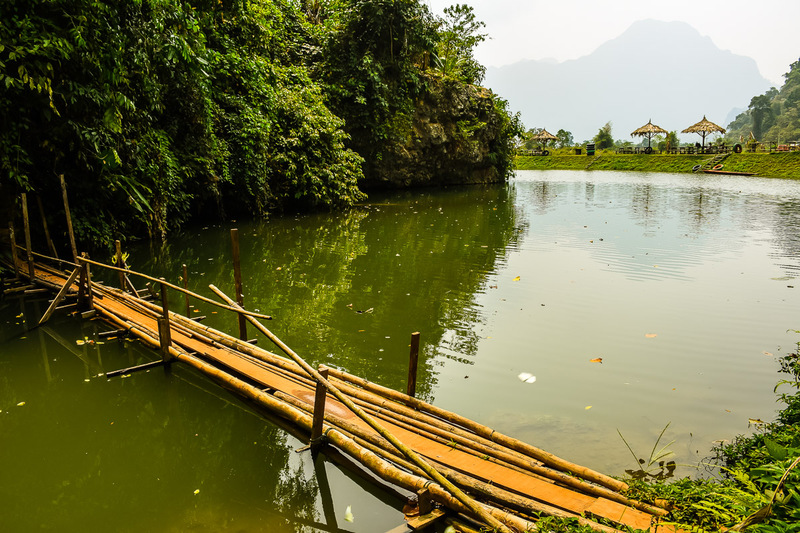 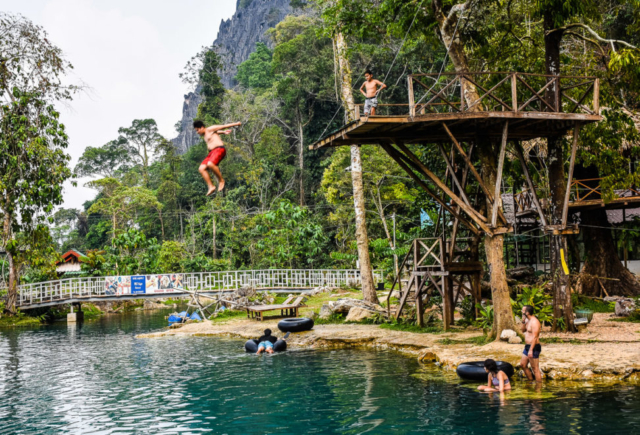 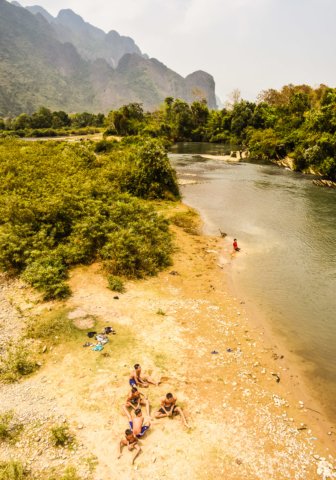 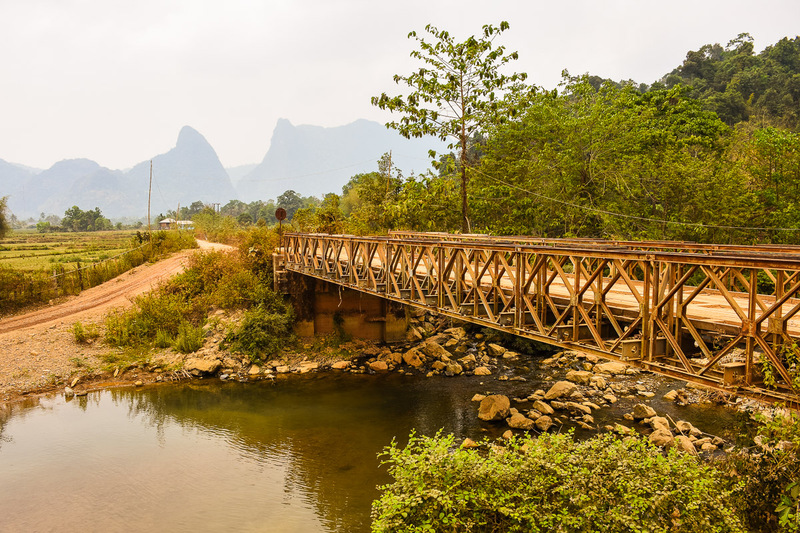 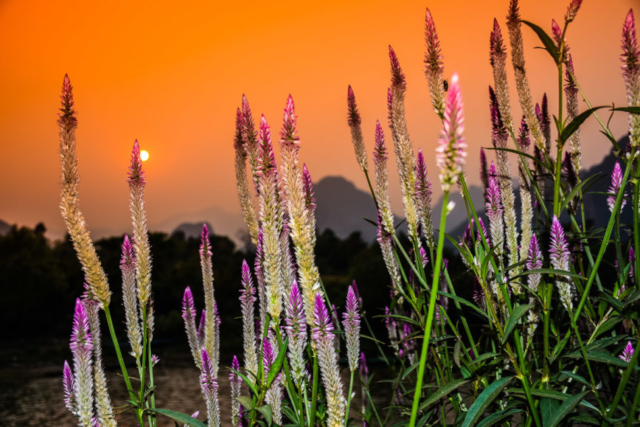 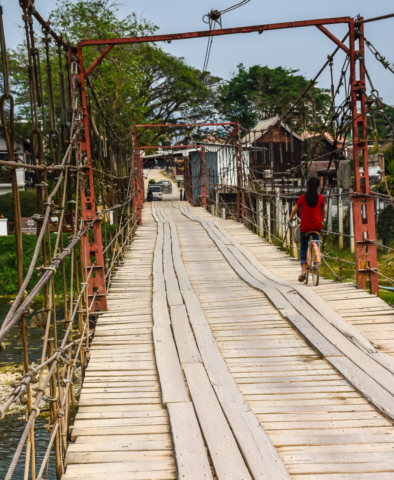 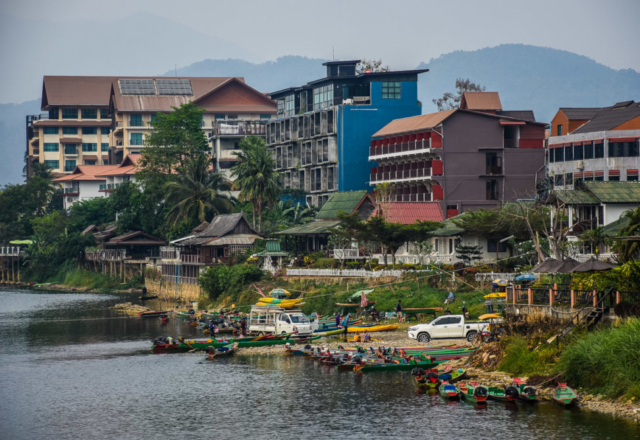 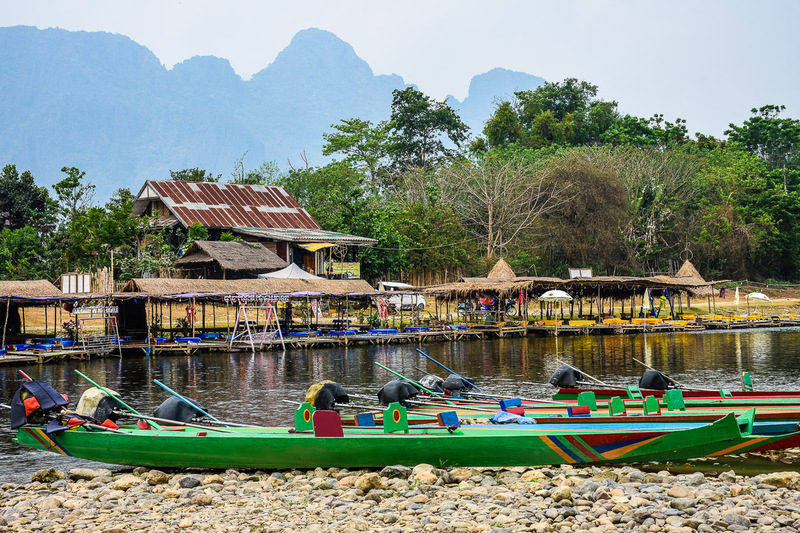 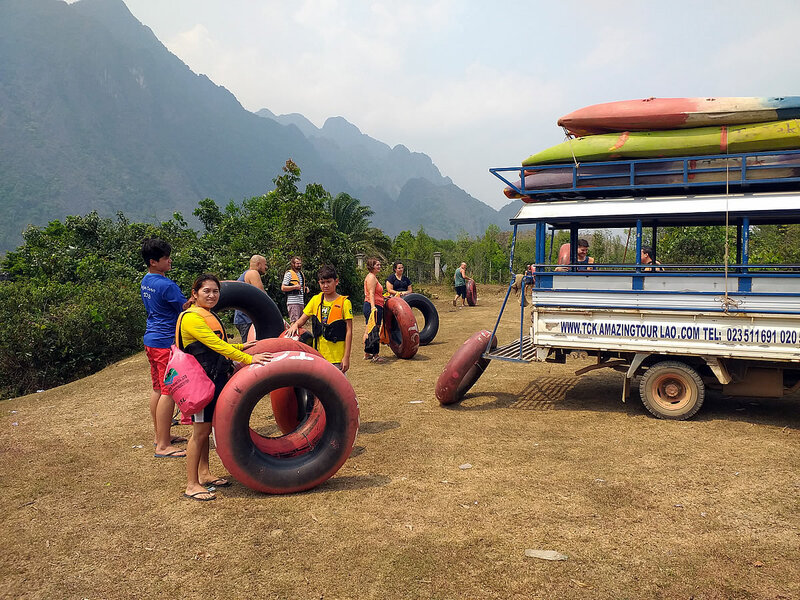 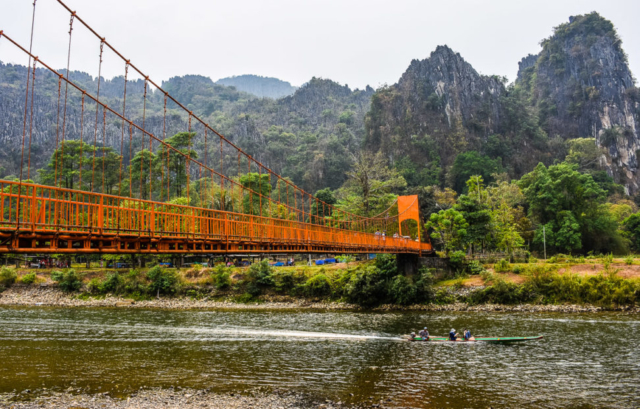 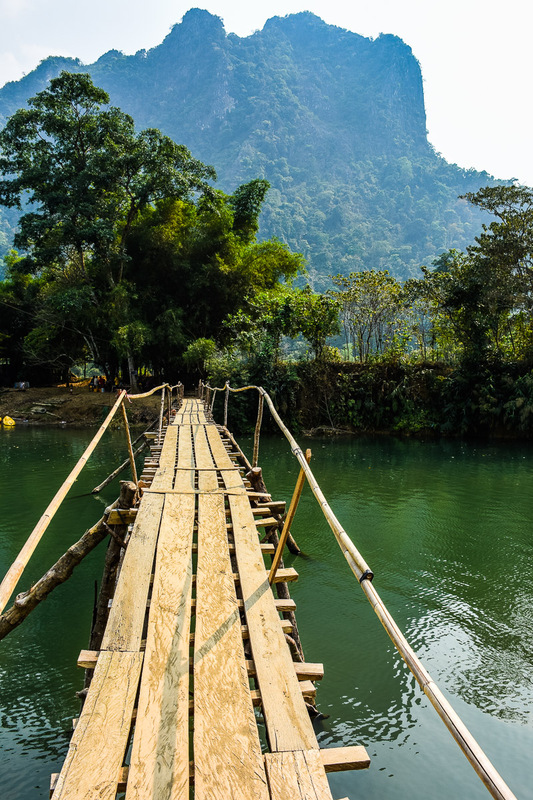 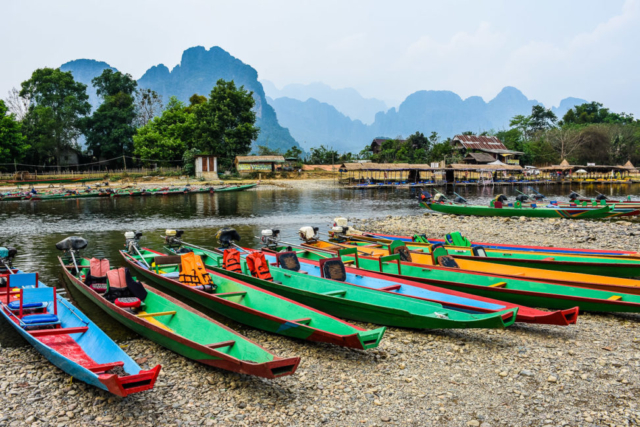 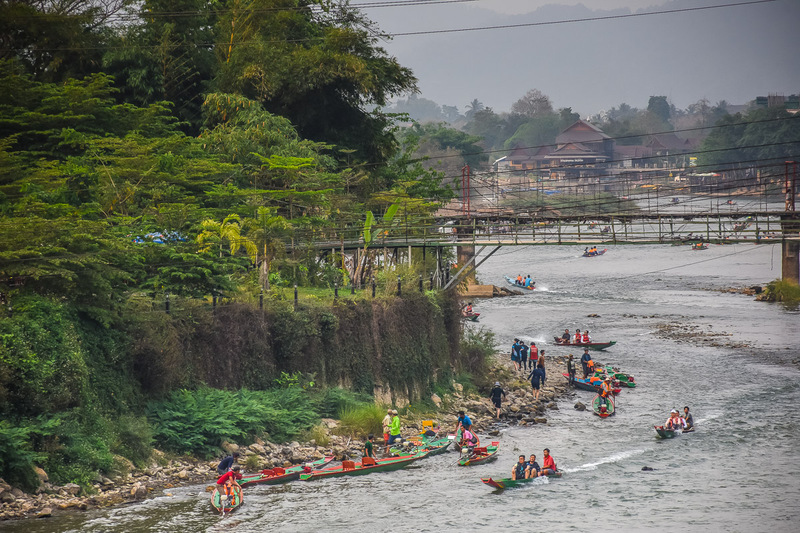 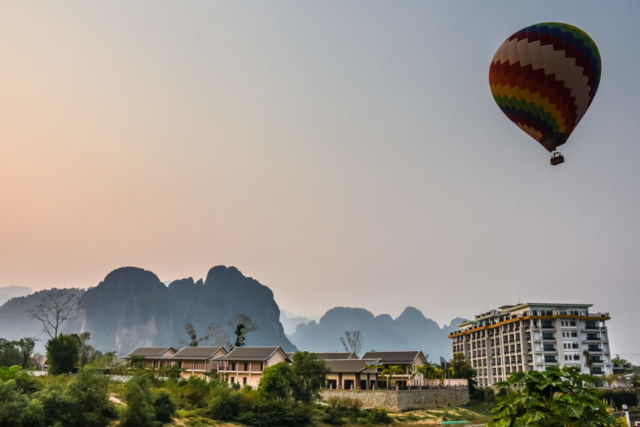 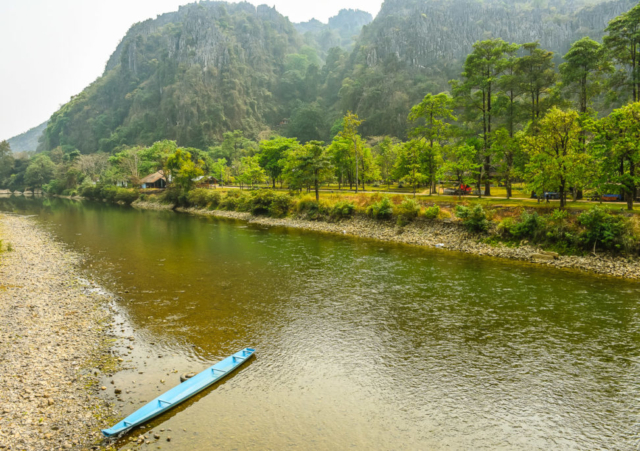 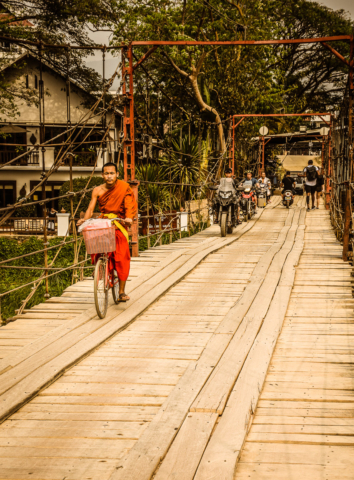 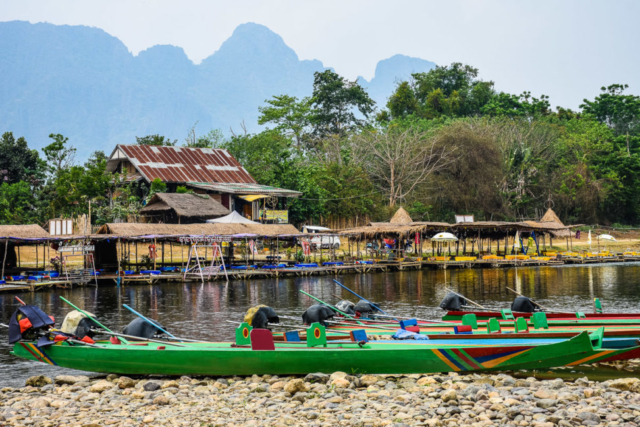 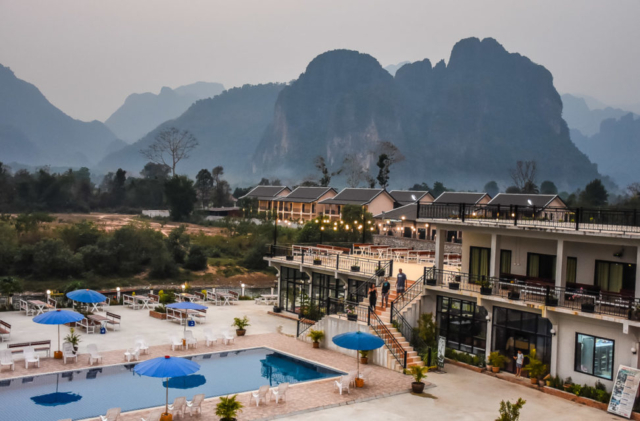 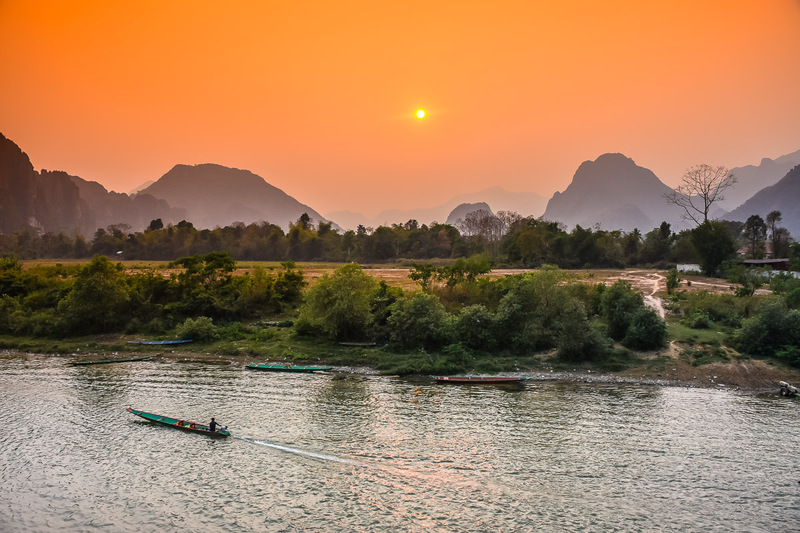 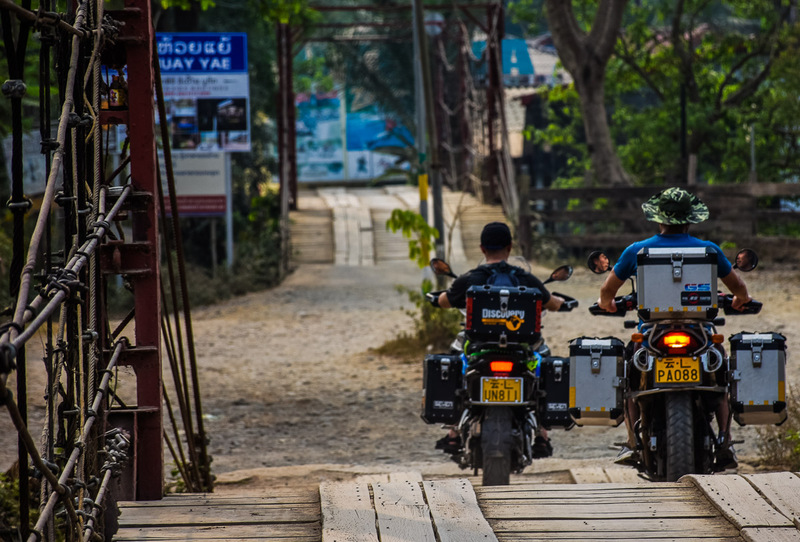 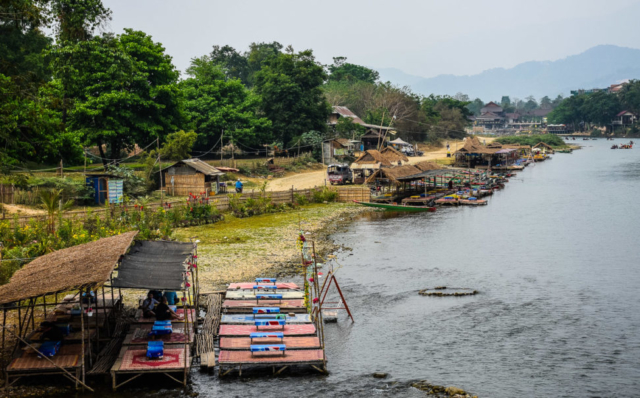 Vang Vieng used to be party central but following a couple of alcohol induced tubing fatalities the local authorities closed a lot of the raucous riverside bars in favour of a more serene experience on the river which is what you get today. 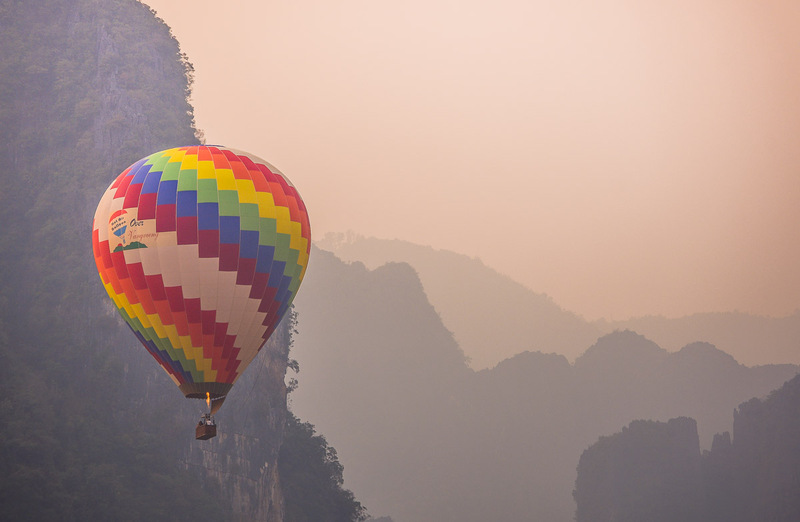 The following day would be a little more adventurous. 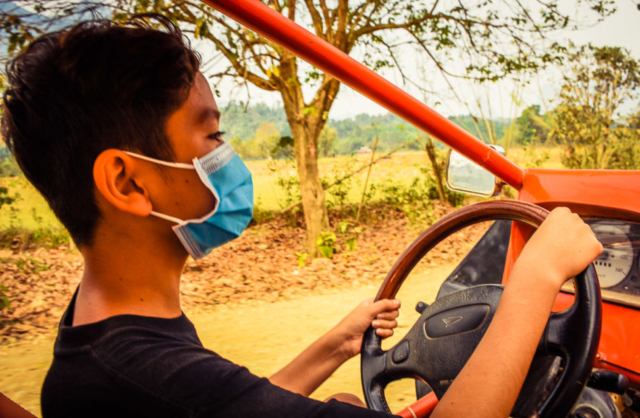 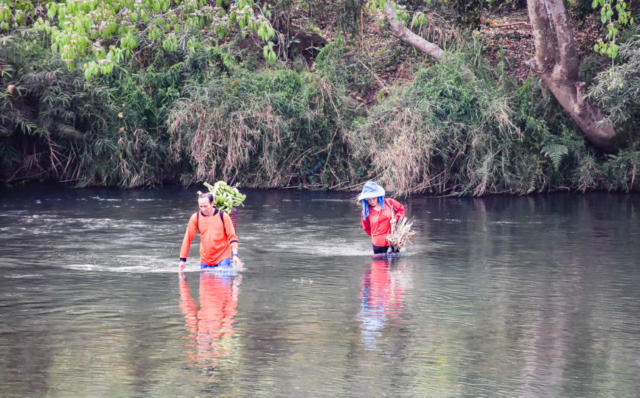 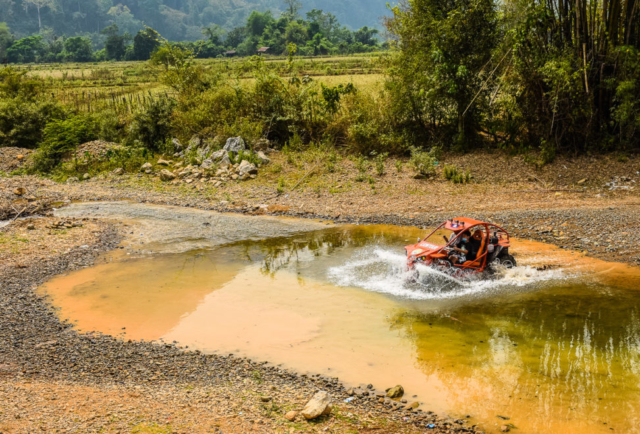 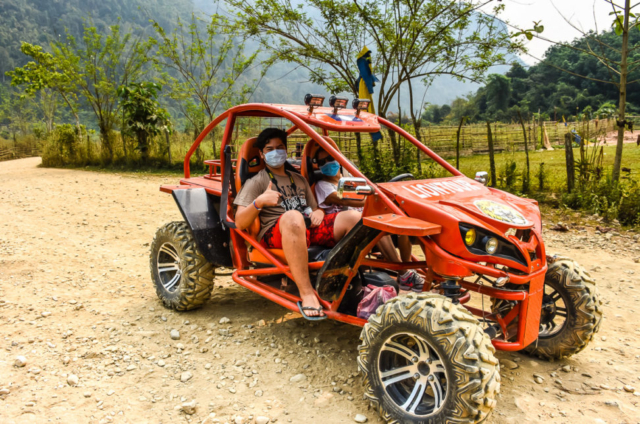 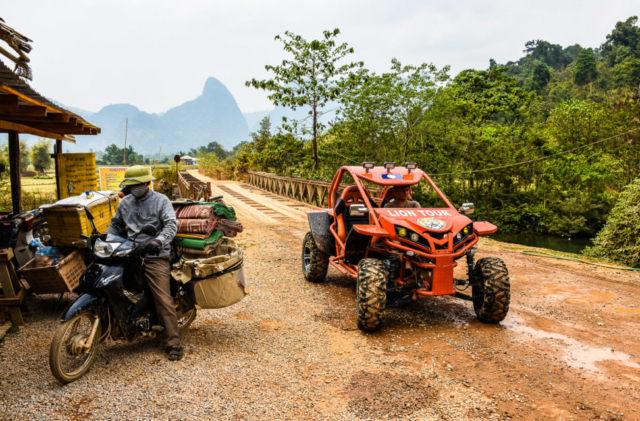 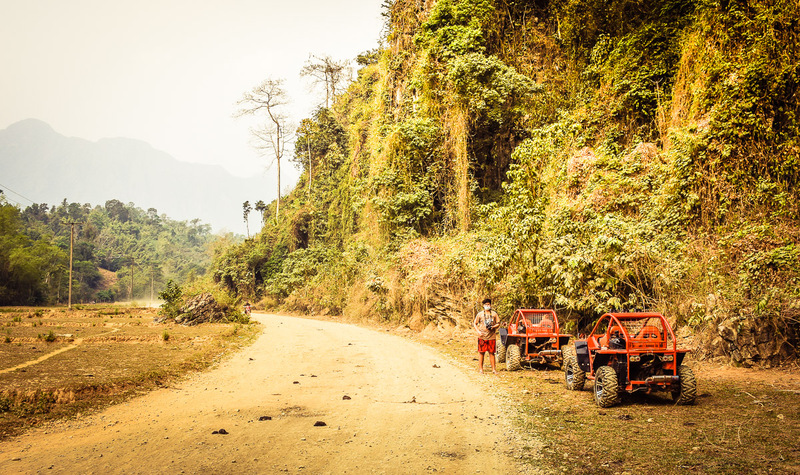 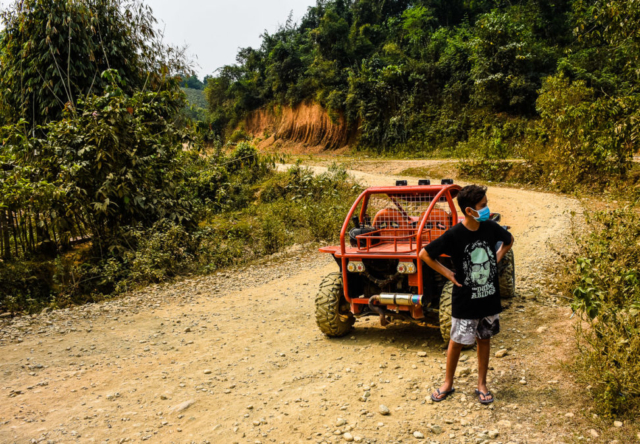 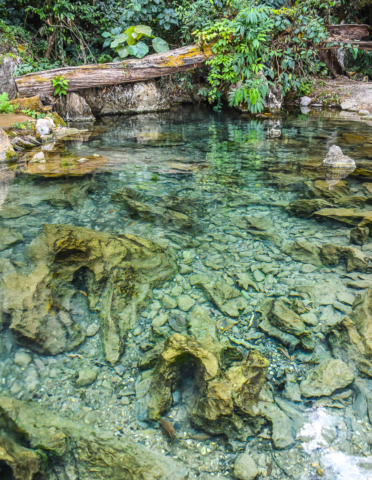 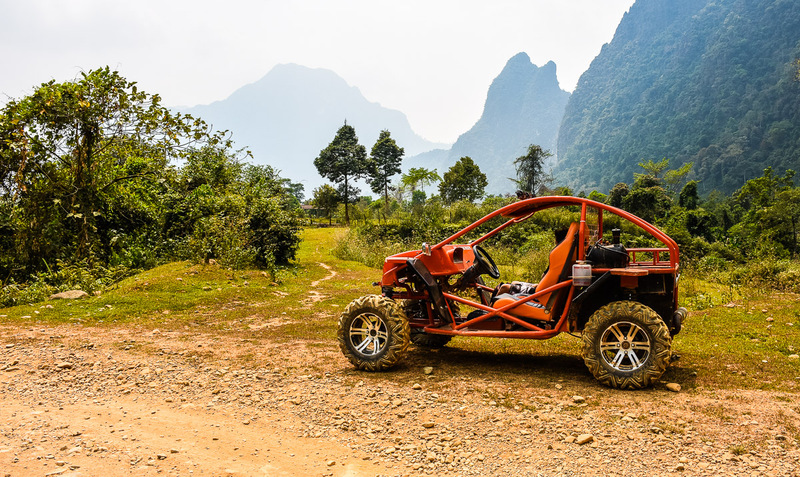 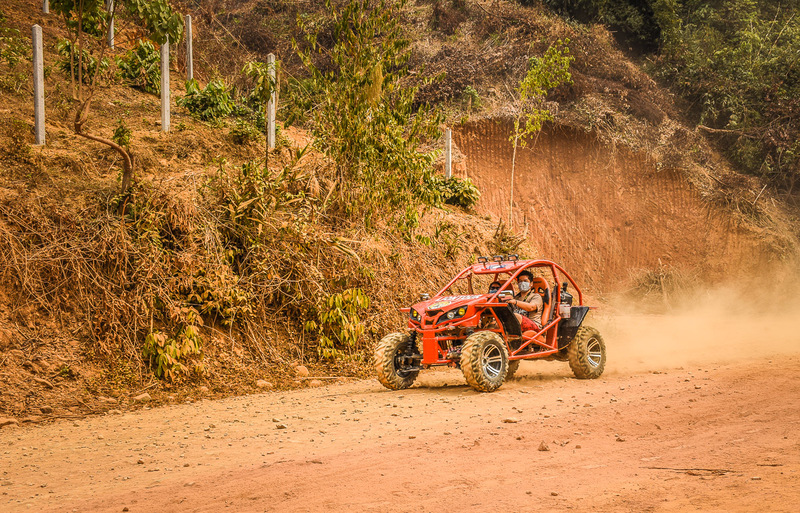 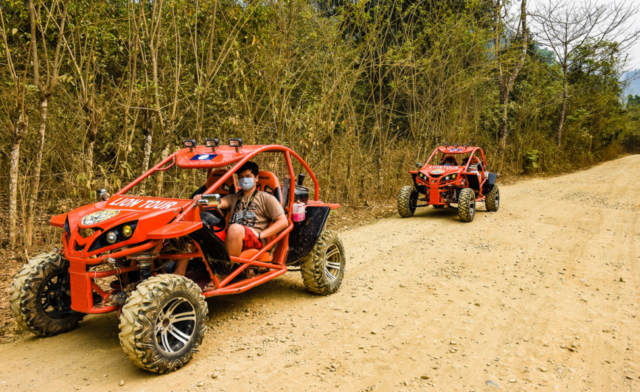 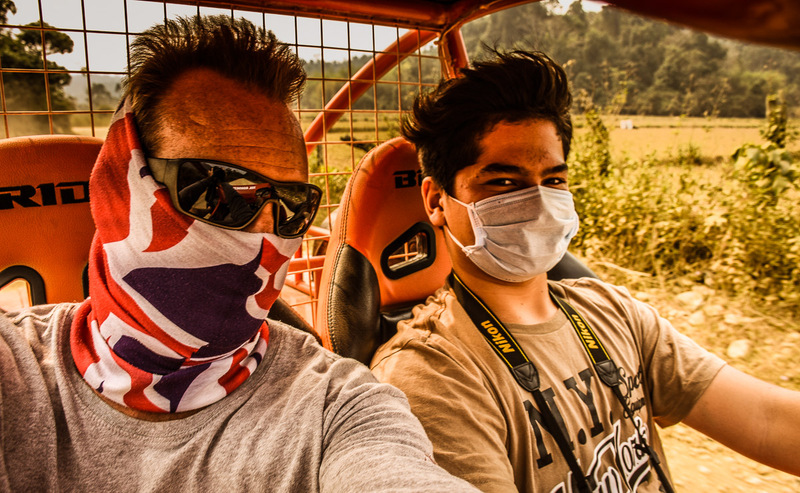 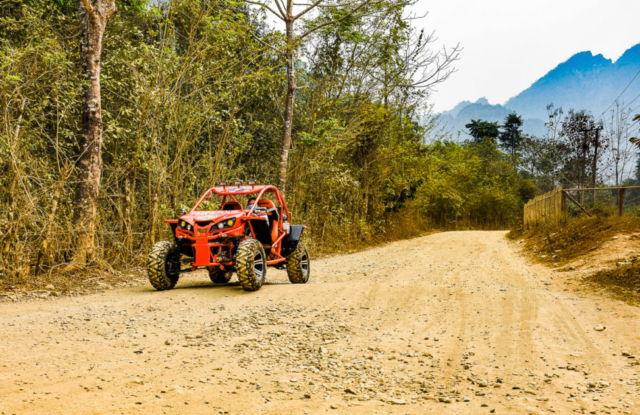 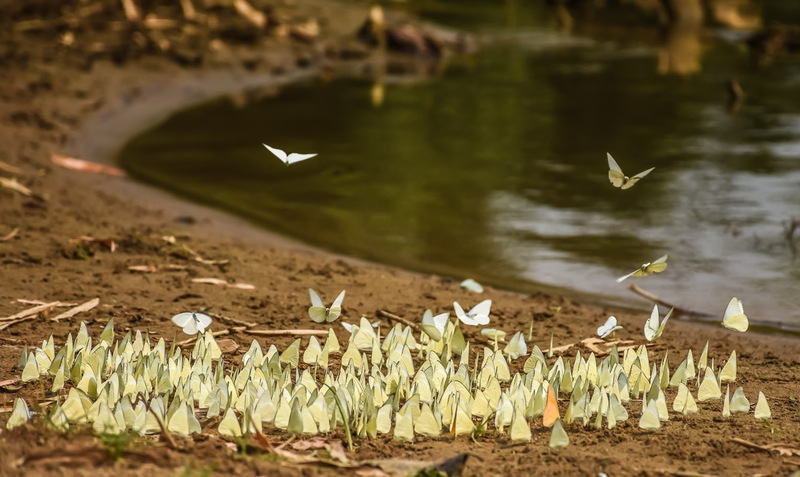 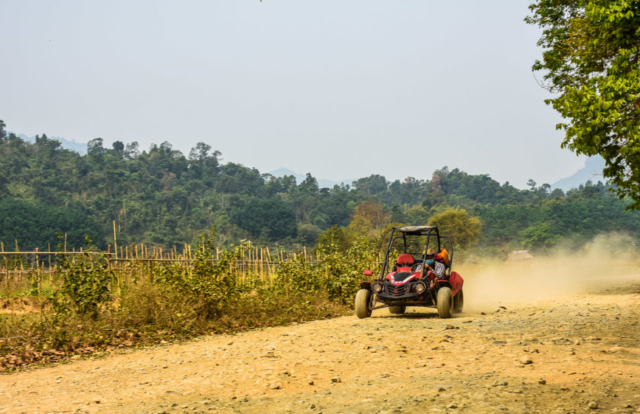 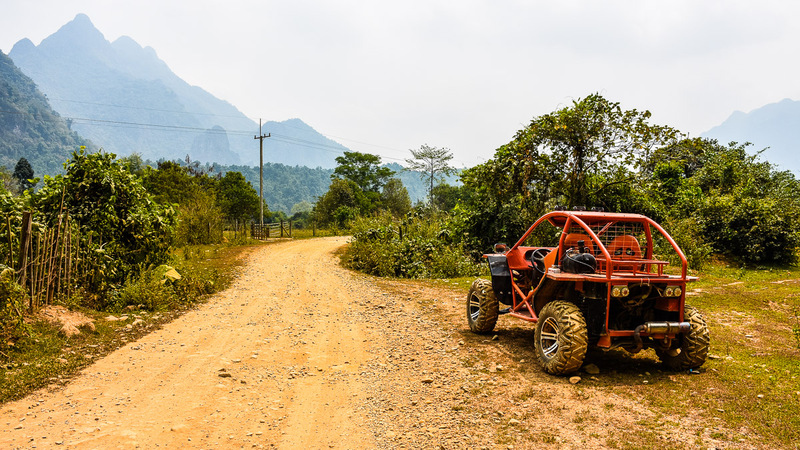 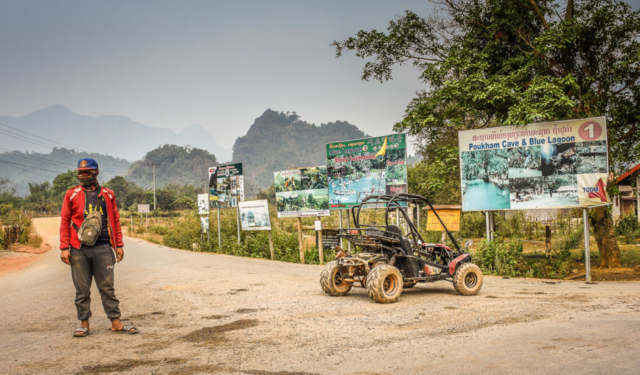 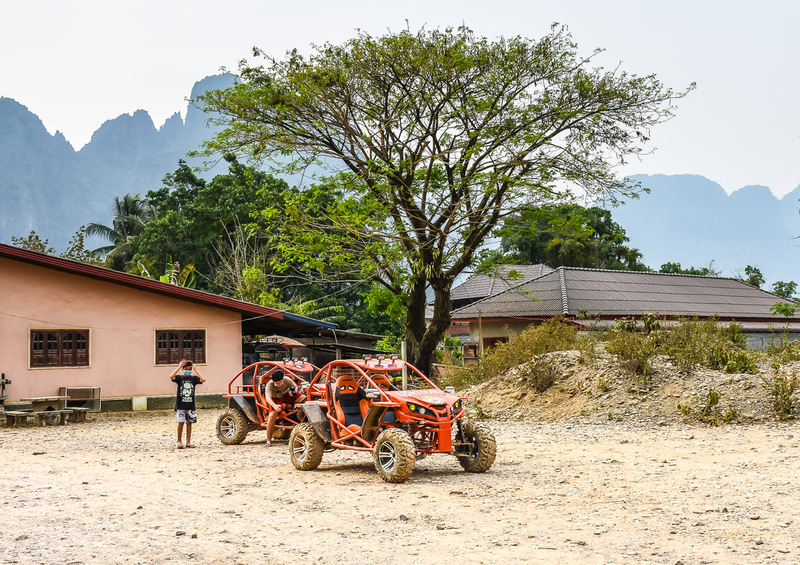 We’d hired a couple of 1000cc off-road buggies and headed west into the valleys where a number of lagoons and swimming holes could be found. 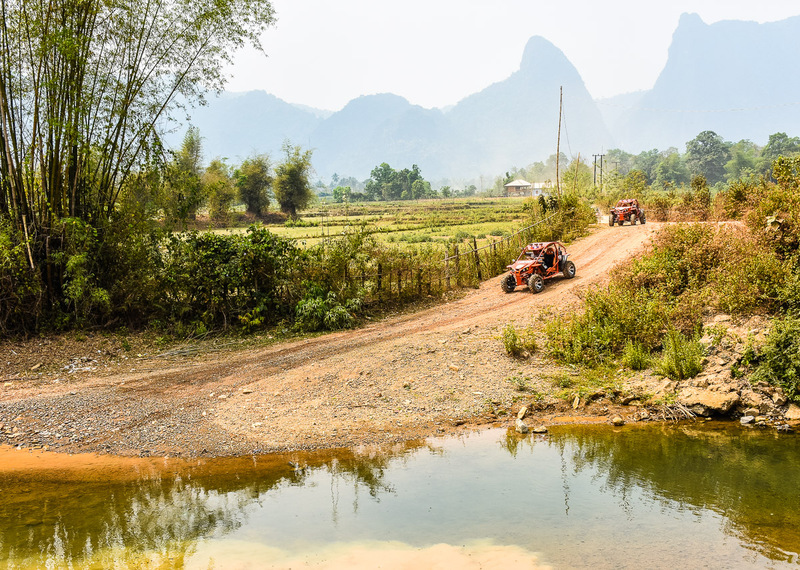 The first one was the largest, and Chinese tour group favourite, so we left that in the dust and motored straight past heading deeper into the valley. 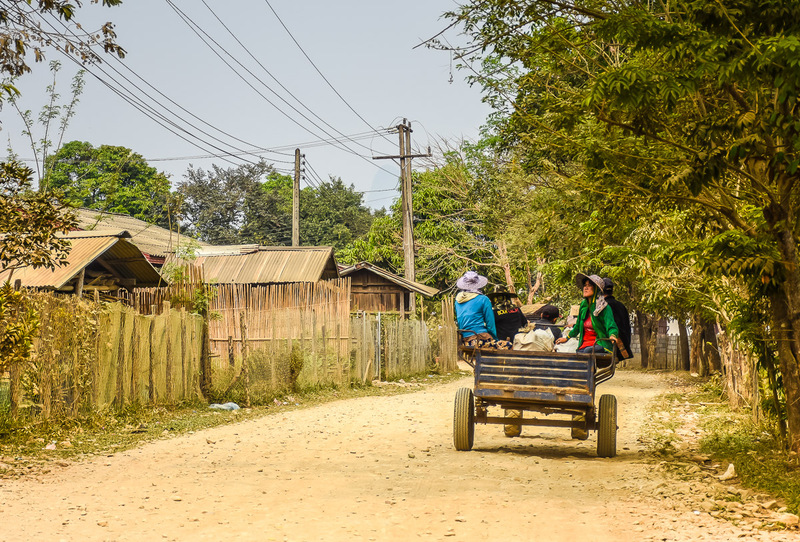 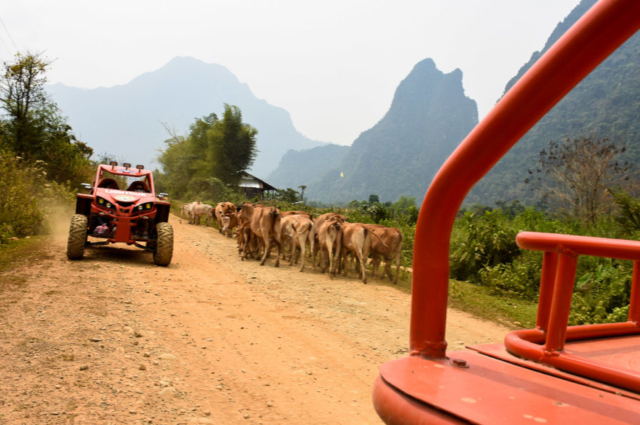 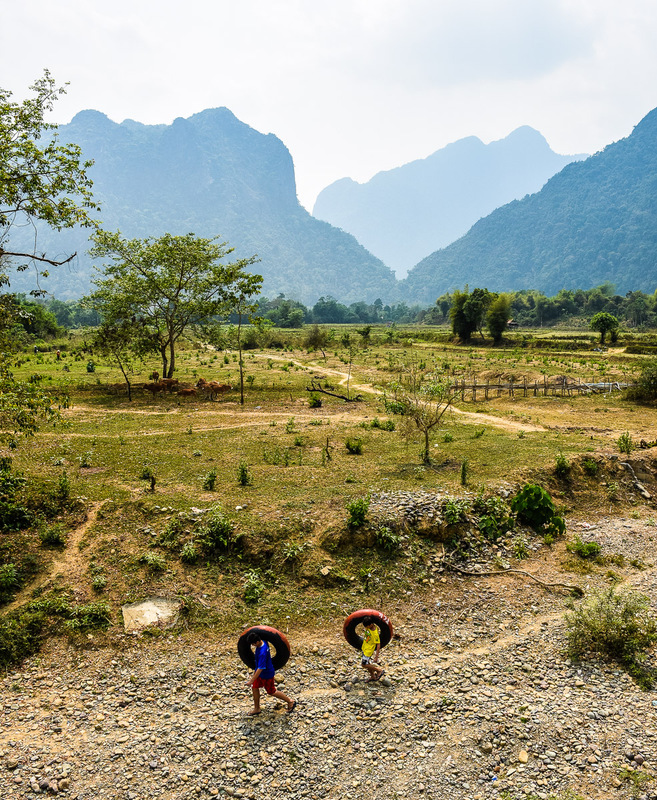 The landscape out here was prehistoric; huge limestone karsts, buffalo wandering across dirt roads, dust covered kids waving from dilapidated tractors, ramshackle wooden villages, and barely cultivated fields full of pigs or chickens. 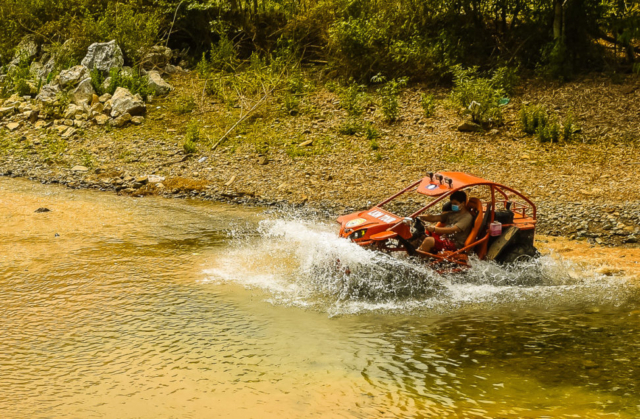 Our first stop, after giving the kids some impromptu driving lessons on trying to avoid going sideways round corners on gravel, was ‘blue lagoon 3’. 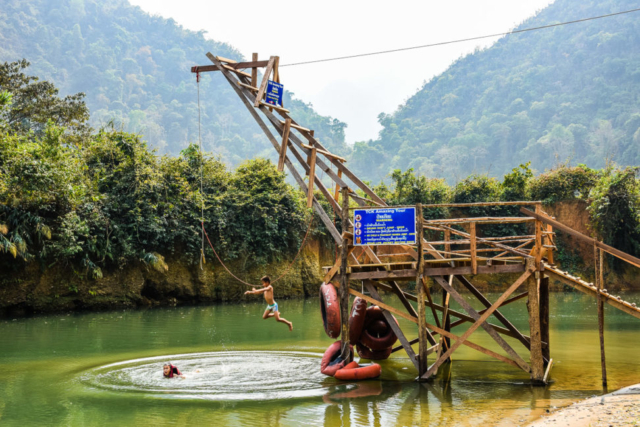 This swimming hole also had a large cave to explore, if you had a decent flashlight, and a zip-line system which was also popular with the Chinese groups who could be heard whooping like gibbons shattering the peace. The ‘road’ petered out at the furthest spot called ‘blue lagoon 5’ which was in fact a small pond that the locals had dammed to create a little oasis. What made it better was the fact that we were the only ones that had ventured this far so had the place to ourselves. 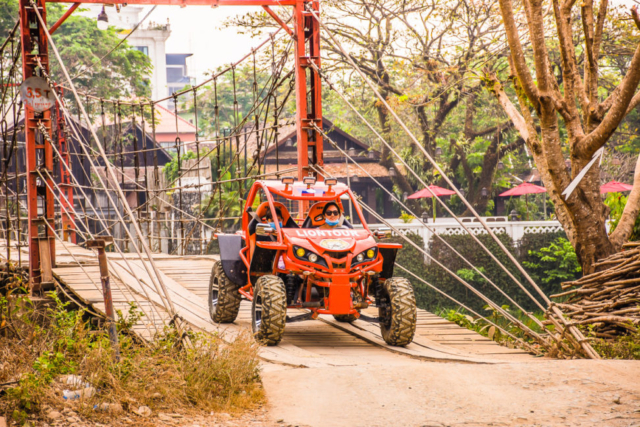 Back on the road, or off it, we motored on to a lunch spot at a small local eatery after giving these buggies the water treatment! Responsible parenting dictates that your children’s first go at driving should involve a river. 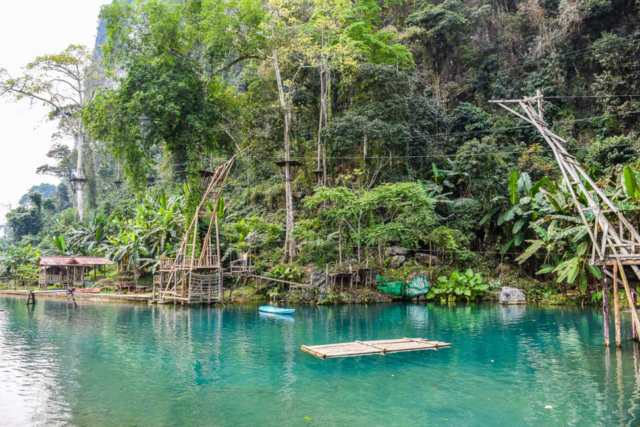 The afternoon took us to ‘blue lagoon 2’ which was an impressive clear water lake with some big jumping platforms. Each lagoon cost a paltry 10,000 kip (37 baht) to enter, totally opposite to the 400 baht that foreigners get fleeced for at many Thai natural attractions. 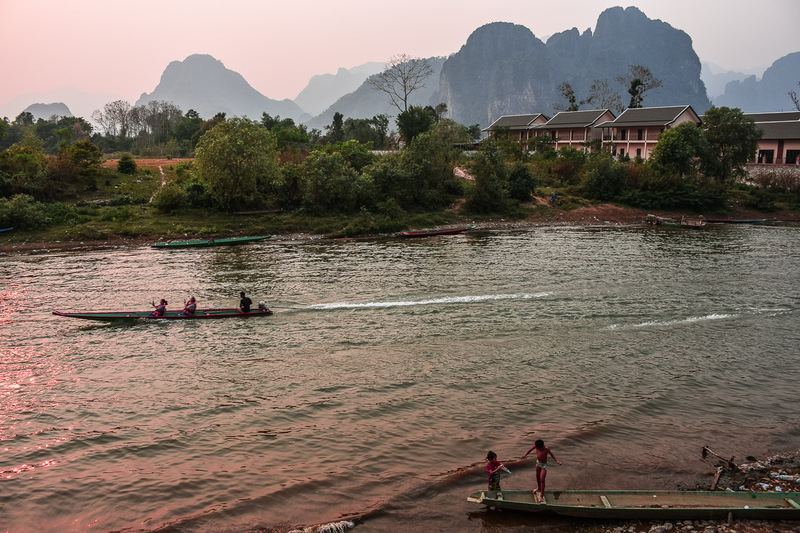 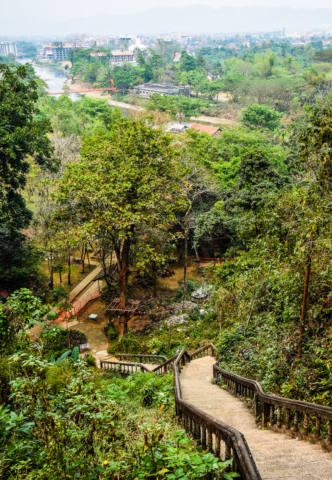 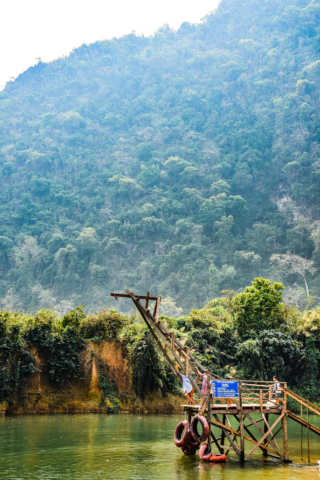 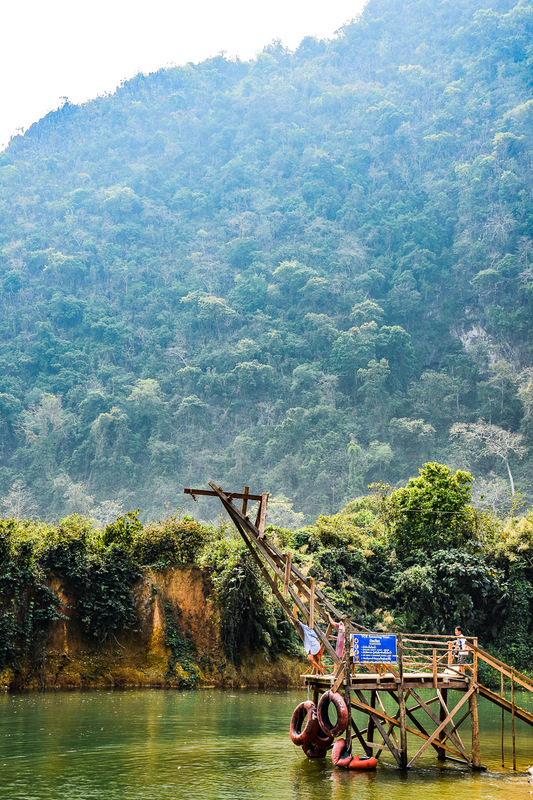 Laos certainly is setup up for unadulterated fun, and they’re not greedy about it unlike their neighbours. 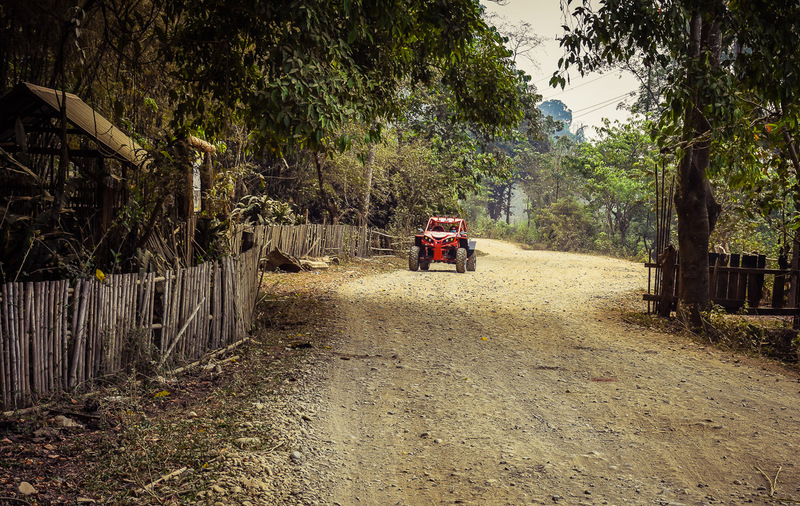 Returning to town covered in mud, dirt and road dust, we were thoroughly exhausted but had just experienced our best day of the trip so far. 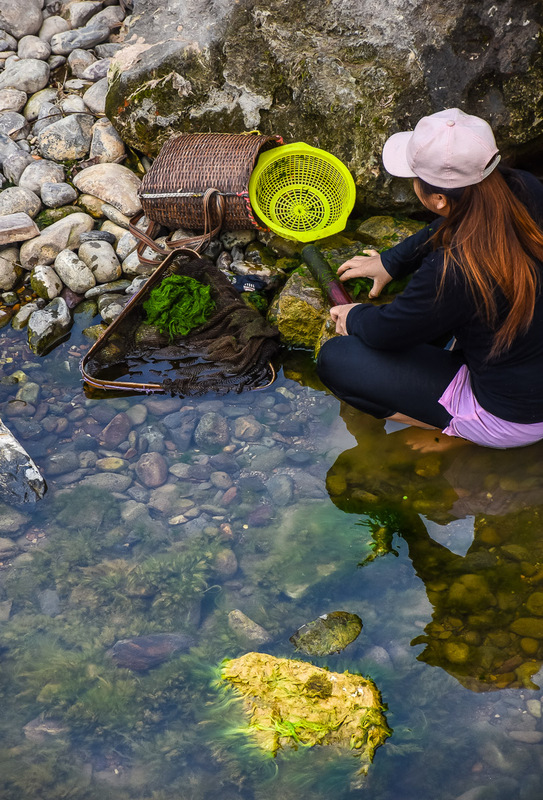 The next day would be a down day to catch up with a bit of work and get some laundry done. A morning shower cleared the air a little and dissipated some of the dust that literally got into everywhere. 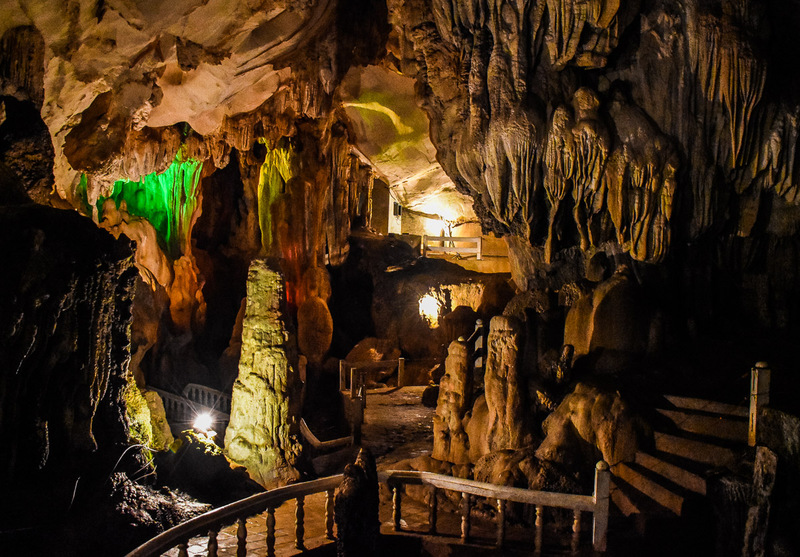 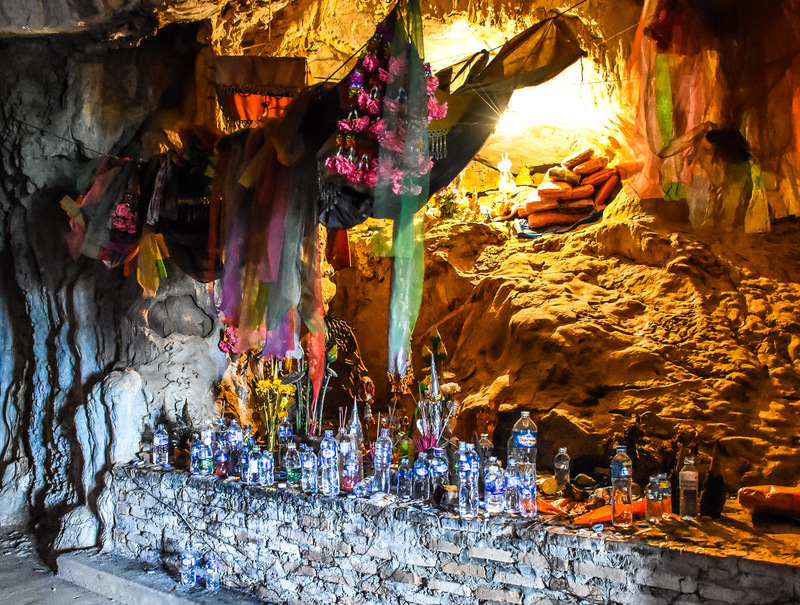 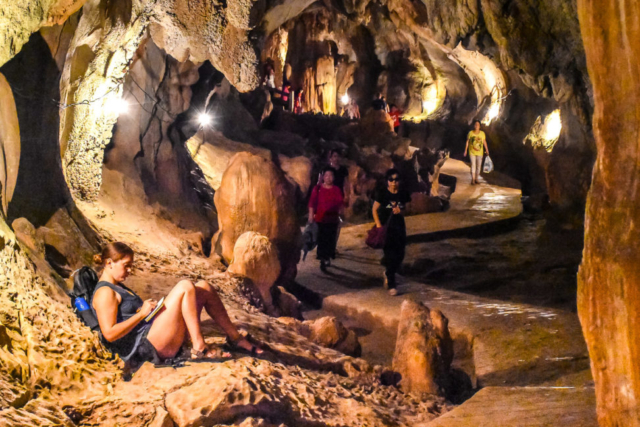 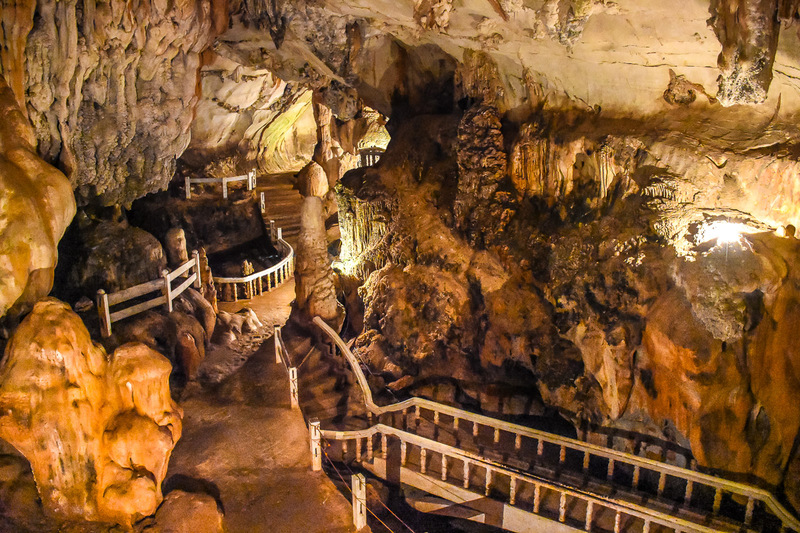 A cave complex called ‘tum jang’ was within walking distance of our hotel so we checked that out after lunch.